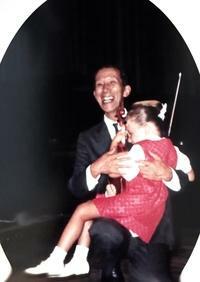 I was fortunate to have been nurtured by the Suzuki Method myself. 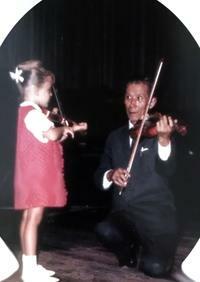 I was invited to play for the American String Teachers Association, 1966 convention as a four year old. I have a sweet memory of Dr. Suzuki guiding my nose towards my scroll. He gave me a warm hug after my lesson. My roots in this positive movement go deep. I eventually pursued two degrees at the Eastman School of Music. I received my B.M. in Violin Performance in 1984 and my Masters in Conducting in 1985. My primary teacher was Peter Salaff of the Cleveland Quartet. He modeled for me a dedication to heartfelt playing as well as the joy of playing with others. I was also immersed in Music History, Theory, and multiple ensembles while at the Eastman School. I have thrived on the very high level of musicianship there. Attending ESM set the standard for my own playing and teaching. 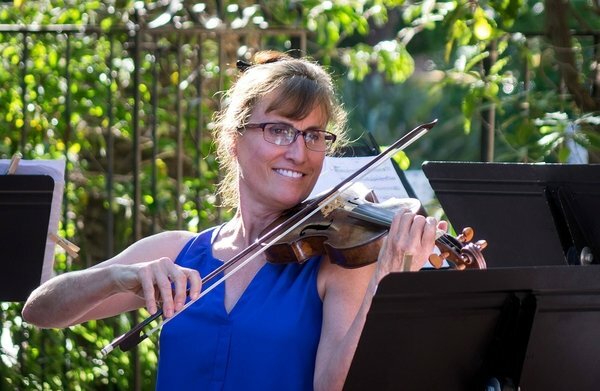 I have enjoyed having a private violin studio since 1985 in my hometown of Escondido, CA. My program includes private lessons, Suzuki Repertoire Classes, and Chamber Music Coaching. I’m always discovering new ways to grow my students technically and musically. My Continuing education has included registered teacher training Levels 1 through 9 from the Suzuki Association of the Americas, Violin Overview courses on Volumes 1-4 and Volumes 6-8, supplementary workshops on a variety of topics including bow technique, left hand development, group class ideas, the history of violin playing and teaching, and more. Influential Pedagogy teachers include Ronda Cole, Cathryn Lee, Linda Case, William Starr, John Kendall, Allen Lieb, Mimi Zweig, and Doris Preucil. I’ve been the Suzuki parent of two children, a pianist and a cellist. This experience taught me to appreciate the necessity for mentoring parents. I feel compelled to work with each parent and student to create a home environment that fosters musical and emotional growth. Currently, I’m pursuing historically informed performance. I attended the Baroque Performance Institute at the Oberlin Conservatory in June of 2015, 2016, and 2018. I study Baroque Violin with Johanna Novom, a member of the Apollo’s Fire Baroque Orchestra and the Diderot Quartet. In August 2017, I attended the American Bach Soloists Academy at the San Francisco Academy. Locally, I’m the principal violinist with the Kensington Baroque Orchestra. Professional Organizations include: Music Teachers Association of California (former President of the Northern San Diego Branch, Evaluator of the Certificate of Merit Program, Co-chair of the VOCE Festival), Member of the San Diego Suzuki Association and the Suzuki Association of the Americas, and freelance musician with the American Federation of Musicians. When I’m not playing or teaching I enjoy gardening, ballet, hiking with my beagle, and visiting my grown children!